New Brunswick, N.J. – Imagine being told as a cancer patient that your disease is not responding to the standard therapy usually given for your type of cancer, but that because of a particular mutation identified in the cancer, a clinical trial may offer some hope with a drug designed specifically to target the abnormality. That was the scenario experienced by Bridget Mooney Spence, who passed away earlier this spring at age 29 from an aggressive form of breast cancer. After being diagnosed at age 21, Mooney Spence faced a courageous battle, which included her participation in a clinical trial that evolved from cancer research efforts known as precision medicine. In recent years, Mooney Spence was honored as a ‘LIFE Hero’ by the Val Skinner Foundation, which has raised more than $4 million over the past decade for The Cancer Institute of New Jersey’s LIFE Center. 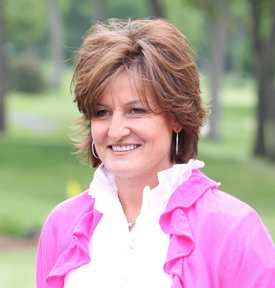 The LIFE (Ladies Professional Golf Association In the Fight to Eradicate breast cancer) Center, named in honor of the advocacy efforts of LPGA veteran Val Skinner, is dedicated to the needs of young women and provides them with information about breast cancer education, prevention and treatment. In helping to accelerate similar discoveries that extended Mooney Spence’s time with her family and to honor her journey with cancer, the Val Skinner Foundation has made a $100,000 gift to the Institute’s precision medicine initiative. Precision medicine drills down to the tiniest of details when it comes to examining molecular and genomic information within each person’s cancer. The aim is to identify genomic changes and patterns in individual cancers that may influence treatment decisions and potential outcomes. To accomplish this, investigators are utilizing Next Generation Sequencing and conducting accelerated data analysis of DNA in tissue samples thanks to advances in sequencing technology. With such precise examination, investigators seek to pinpoint mutations that drive cancer cells to grow. Armed with that information, researchers believe the opportunity exists to identify targeted therapies for treatment. "What we have learned through the years is that cancer is not a single disease, but rather a collection of diseases each with unique features. For instance, breast cancer can respond very differently to treatment options in one patient from another, even though the two were administered the same medicine," notes Shridar Ganesan, MD, PhD, associate director for translational science at The Cancer Institute of New Jersey, who is part of the precision medicine initiative. "That is why research needs to be focused on numerous aspects of the disease in order to better classify it. Instead of determining cancer type only by the organ in which it originates, genomic analysis opens the door for additional classification by the set of genomic changes present in each cancer, which can guide more precise or tailored therapy. We are grateful to the Val Skinner Foundation for its commitment to our research efforts," adds Dr. Ganesan, who is an associate professor of medicine and pharmacology at UMDNJ-Robert Wood Johnson Medical School. Skinner is no stranger to cancer, having helped conceptualize the LIFE Center at The Cancer Institute of New Jersey after losing a young friend to breast cancer – a center that continues to be supported by her role in the annual LIFE Event charity golf outing. Her advocacy has led to the development of four other such centers across the state at affiliate hospitals within The Cancer Institute of New Jersey Network. But Skinner knows unlocking the mysteries of cancer through research is key. "There has been a lot of progress in the treatment and management of breast cancer, but there is a long way to go. The reality is, saving young women’s lives still exists in the laboratories," noted Skinner. "As Bridget’s story illustrates, precision medicine can lead to pathway discoveries that can extend and hopefully enhance the quality of life for patients, not only for those with breast cancer, but for all cancers. However, there is much work still to be done, and I’m especially pleased that the Val Skinner Foundation can contribute to the life-saving advances being made through precision medicine research." As part of the initiative, sequencing results are discussed regularly by an array of specialists including oncologists, researchers, geneticists, statisticians, math and computer experts and others to determine individual treatment options for patients. "An overall goal of the project is to perform a detailed genomic analysis of every patient’s cancer and to develop new clinical trials using drugs that target DNA changes found in each patient’s tumor," noted Lorna Rodriguez, MD, PhD, director of the precision medicine initiative and professor of obstetrics, gynecology and reproductive sciences at UMDNJ-Robert Wood Johnson Medical School. While researchers are examining more prevalent cancers such as breast and prostate, it is believed that The Cancer Institute of New Jersey is one of the few facilities in the nation that also concentrate on patient populations with rare cancers for whom treatment options have been few or non-existent. As the initiative grows, Cancer Institute of New Jersey investigators will collaborate with researchers from Rutgers, The State University of New Jersey, and others in bringing results to fruition. The Val Skinner Foundation in recent years also contributed to the purchase of an XF extracellular flux analyzer system, known as the "Seahorse," enabling Cancer Institute of New Jersey researchers to have a better understanding about cancer cell metabolism. “This gift not only is helping to grow a key area of cancer research, but is also helping to attract other grants from entities like the National Cancer Institute and private donors to advance our knowledge about cancer development,” noted Cancer Institute of New Jersey Director Robert S. DiPaola, MD. “As with the Seahorse and now with the precision medicine initiative, we greatly appreciate the efforts of the Val Skinner Foundation in helping to drive new cancer discoveries,” added Dr. DiPaola, who is also a professor of medicine at UMDNJ-Robert Wood Johnson Medical School. The Cancer Institute of New Jersey (www.cinj.org) is the state’s first and only National Cancer Institute-designated Comprehensive Cancer Center dedicated to improving the detection, treatment and care of patients with cancer, and serving as an education resource for cancer prevention. Physician-scientists at The Cancer Institute of New Jersey engage in translational research, transforming their laboratory discoveries into clinical practice, quite literally bringing research to life. To make a tax-deductible gift to support The Cancer Institute of New Jersey, call 732-235-8614 or visit www.cinjfoundation.org. Follow us on Facebook at www.facebook.com/TheCINJ. The Cancer Institute of New Jersey is a Center of Excellence of the University of Medicine and Dentistry of New Jersey-Robert Wood Johnson Medical School.